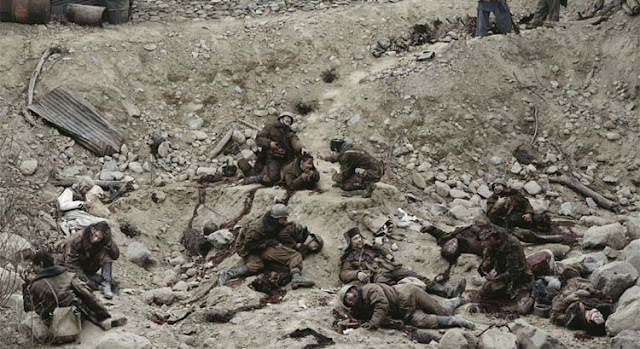 Jeff Wall- "Dead Troops Talk"
The final chapters of this book explain that war photography is art. Her writing becomes even more passionate while closing up the final chapters of the book. War photographs are very powerful and mean a lot but what we have to understand and remember is these images reveal real people. We will never understand what they really go through no matter how long we stare at these images. These people shown in these war photographs had a life and family. I feel like sometimes people just look at these images as a whole and don't really understand the meaning behind these photographs. This book really has shown me to dig deeper in photographs, especially war images. There is more behind the hurt soldier or dying child. These people were in pain. We can not take these images and photographs that we have for granted. We are lucky to have the memories and history of the war through these photographs. These photographs allow us to think about what happened in the past. We can not remember because we were not there fist hand, but we can look back and be grateful that we know what happened during these wars.